Most chemistry courses teach that heat breaks down proteins, whether the reaction is the heat from a pan breaking down the protein in eggs or the heat from a straightening iron breaking down the protein in hair. Heat causes many changes to the structure and function of protein, especially in foods. A common concern among many people is whether or not heat destroys the nutritional quality of high-protein foods. 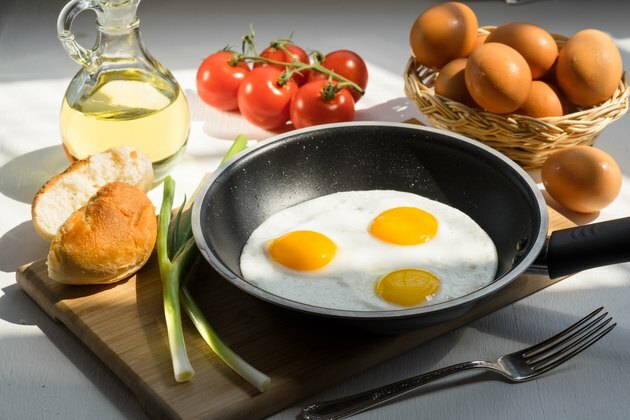 Although heating a food product that contains protein causes several structural changes to the protein and the linkages between proteins, the nutritional value of the food does not change. According to Cornell University, when casein and whey (two types of protein found in dairy) are heated, no changes result in the digestibility or nutritional content of the protein than before it was heated. According to Cornell University, heating proteins increases their water-holding capacity. That means that the food product that contains the protein has the ability to take in more moisture in the product. This may not seem important, but it is a vital function in maintaining the proper texture of yogurt, for example. Protein denaturation is a complicated process that basically involves breaking down long chains of amino acids, which make up proteins, into smaller pieces and smaller, less complex chains, according to Cornell University. This occurs by heating a protein and also by physical agitation, such as stirring. For instance, when you scramble an egg, you are breaking some of the chemical bonds that hold the egg together, essentially changing its structure. The Accidental Scientist website found that a reaction called the Maillard reaction occurs when protein in foods, such as meats, are heated. The Maillard reaction involves destroying some of the food enzymes that were active prior to heating. This causes a browning in the color of the food and can be seen most often in the browning of beef and steak when they are cooked. A study by Clemson University tested the changes in functionality of proteins found in various dairy products when they were heated. The study found that when proteins from dairy products were heated, they lost their solubility, or their ability to absorb in water. They also lost many of their functions that were important in food manufacturing. While heating protein is beneficial for some manufacturing and baking purposes, it hinders others. Does Cooking Food Affect Protein Content? Does Chicken Lose Protein If It Is Boiled?